Full-time experience, creative home marketing & outstanding service for Pittsburgh's home buyers and sellers. Welcome to my Active Rain profile, the place to find real estate help, information and homes in the Pittsburgh, Allegheny County, Westmoreland County and Bulter County areas! If you are looking for a historic home on the Northside, a cool condo in Shadyside, a beautiful bungalow in Regent Square, a sweet suburban address, or anything in-between, I'm here to help you make it your home. As a full-time RE/MAX agent I believe in good customer service - like returning phone calls quickly, paying attention to details, keeping promises and being worthy of your trust. I provide creative home marketing, expert representation and advice that will help you reach your buying and selling goals. I look forward to working together. Check out my website or call me at 724-933-6300 x214. 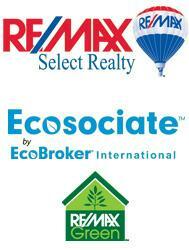 I am a lifelong resident of Pittsburgh and full-time real estate agent with RE/MAX Select Realty. I grew up in Hampton, and then moved to the west, south, and now the east of the city, where I live with my husband and two kids. I have a Bachelor's degree from Ohio University in Communications and Graphic Design. This led to a 15-year career in design, advertising, marketing and technology. I still use those skills every day in my real estate business by putting a creative mix of marketing ideas to work for my clients. I pride myself on my ability to look at how things have been done in the past and then find new ways to do them better. I am a firm believe in the lost art of customer service so I work hard to return calls and emails quickly, communicate with my clients, pay attention to the details and live up to my promises. In my spare time you will find me outside, whether it's mountain biking, skiing, road racing, triathlon or running. I even am one of the sponsors of my bike racing team, Sette Nove, and a member of the Allegheny Cycling Association, Bike Pittsburgh and Mon Valley Ski Club. I am also the 2013 Cat 3 Women's National Champion for mountain biking, which was super fun to win. Christa helped my fiance & I recently purchase our new home. She was extremely helpful, attentive and very professional throughout the process. I would highly recommend her as an agent. Christa Ross is a fantastic realtor; she had great ideas to help sell my house. She has a complete understand of new technology to make homes energy efficient. Christa is always in contact during the selling process. She was a partner in the whole sales process. I will always use Christa Ross in selling my homes. Christa worked with me as a buyer's agent when I was looking for a house in 2010, and she helped me find a house I love in just one weekend, with a minimum of stress and drama. I think she'd be a terrific seller's agent. She knows the local market, knows what buyers want, she's tech-saavy and a great communicator, online and in person. Christa is particularly good at marketing houses online, through text, pictures and video. She writes compelling copy about the houses she sells, not rote recitations of room-sizes or ham-fisted descriptions in ALL CAPS. She specializes in green homes and can provide guidance and advice for making your home more energy-efficient, a big selling-point for younger buyers (I wish there were more green-home initiatives for her to market in Pittsburgh). She's personable and a pleasure to work with. If I ever sell my house, I would definitely want to work with her again.